The shallow waters of Five Cays Beach, Providenciales. Found at one of the three original settlements on Providenciales, the beach here is nice but the water tends to be quite shallow. Due to the surrounding structures and the occasional piece of junk equipment, this beach does not have as natural a vibe as other beaches. 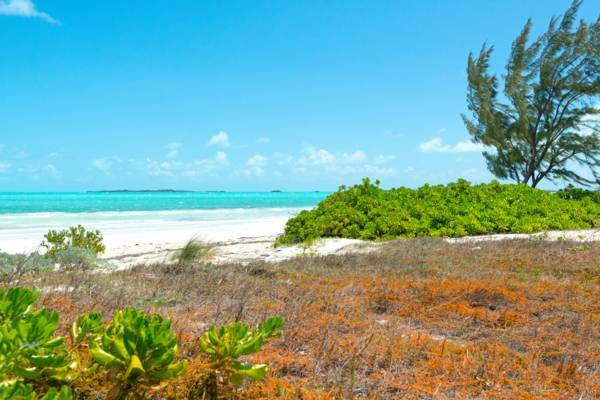 Located along the south coast of Five Cays, one of the three original settlements on Providenciales, Five Cays Beach is a 5000 foot long stretch of clean sand and water. The water depth here is quite shallow (only a few feet deep) for a distance out. There’s no good snorkelling in the area. The beach doesn't typically experience large waves, however it is exposed to the regular southeast trade winds and can be a little bit choppy at times. Due to being situated in the village of Five Cays, privacy can be lacking at times. The popular Bugaloo’s Restaurant is located at the southwest end of this beach. Five Cays Beach shares many similarities with the kiteboarding hotspot of Long Bay Beach. Both feature shallow water and are exposed to the eastern trade winds. One increasingly popular kite route is a down-winder from Long Bay to the Bugaloo’s Restaurant at the southwestern end of the Five Cays, a 9 mile (14.5km) scenic journey. On the way down, your pass the inlet to Juba Sound, the beautiful coast of Turtle Tail, Cooper Jack Bay, and Discovery Bay, along with many tiny and uninhabited islands. To get to Five Cays Beach, Turn onto Five Cays Road from South Dock Road. Drive .3 miles (.5km) and turn left directly before the Five Cay Community Center. Alternatively, the Bugaloo’s Restaurant area is also a convenient beach access. This access can be found at the southwest end of Five Cays Beach next to Bugaloo’s Restaurant and offers plenty of parking. Access at the northeast end of Five Cays Beach.